2010-10-19 16:00:14 [Message] fib_1618 -> Chat: how is everyone? 2010-10-19 16:00:30 [Message] thespookyone -> Chat: Very well, and you? 2010-10-19 16:01:42 [Message] fib_1618 -> Chat: how bad? 2010-10-19 16:04:17 [Message] fib_1618 -> Chat: OK...any questions or comments before we get started?? 2010-10-19 16:04:58 [Message] fib_1618 -> Chat: hey doc! 2010-10-19 16:05:08 [Message] doc -> Chat: hey there! 2010-10-19 16:05:09 [Message] fib_1618 -> Chat: when was the ideal date for the 20 week Hurst low? 2010-10-19 16:05:57 [Message] fib_1618 -> Chat: don't you love the way the market plays catch up to cycle nesting's? 2010-10-19 16:06:32 [Message] fib_1618 -> Chat: it's like: "hey...we're supposed to bottom around here...let's give the old heave ho and collapse!" 2010-10-19 16:07:24 [Message] fib_1618 -> Chat: "basketball in the deep end of the pool"
2010-10-19 16:07:33 [Message] doc -> Chat: When was the last time we got a big down day and closed on the lows and had ES keeping drifting down after the close?? 2010-10-19 16:09:02 [Message] fib_1618 -> Chat: that's what you want, right? 2010-10-19 16:09:09 [Message] fib_1618 -> Chat: the many to believe the opposite? 2010-10-19 16:12:02 [Message] fib_1618 -> Chat: for now...it's the proverbial "pause to refresh"
2010-10-19 16:15:34 [Message] doc -> Chat: How important is the line connecting the MCO lows in late May (FLAG) and late Aug on both the common and the composite? 2010-10-19 16:15:58 [Message] thespookyone -> Chat: agreed! 2010-10-19 16:17:20 [Message] tonny.holdorf -> Chat: if the trend line is broken will the Elliot count then be different? 2010-10-19 16:18:26 [Message] fib_1618 -> Chat: let me get my ruler and check..
2010-10-19 16:20:14 [Message] doc -> Chat: I used a very very thin line and got a tiny break below, maybe by a couple of points. 2010-10-19 16:22:27 [Message] fib_1618 -> Chat: with my mentioning of the "speed of trend was slowing"
2010-10-19 16:24:30 [Message] fib_1618 -> Chat: that this is what I like to call "turnaround Tuesday"
2010-10-19 16:27:17 [Message] doc -> Chat: Keeping the components above the zero line and getting the NYAD to its 19ema would be a 2-3 day correction affair, no? 2010-10-19 16:28:30 [Message] doc -> Chat: this might suggest a longer period of time in negative land for better balance and so there is the rub. 2010-10-19 16:28:49 [Message] fib_1618 -> Chat: and the rising bottoms line etc. 2010-10-19 16:35:20 [Message] doc -> Chat: If tomorrows breadth is negative, and we break the MCO trendline, does that speak to a longer correction to you than through Thurs of this week? 2010-10-19 16:36:50 [Message] doc -> Chat: what about the divergent MCO levels from July 1 and the mildly broken level from late August, are they important to watch? 2010-10-19 16:40:30 [Message] fib_1618 -> Chat: what do you see? 2010-10-19 16:40:49 [Message] fib_1618 -> Chat: did the 19 cross the 39? 2010-10-19 16:42:09 [Message] fib_1618 -> Chat: the market "speeds up" to reach a goal it "might had forgotten about"
2010-10-19 16:43:27 [Message] fib_1618 -> Chat: has it been any different than what we had during the 2008-2009 collapse? 2010-10-19 16:45:12 [Message] fib_1618 -> Chat: and how many bears came out today I wonder? 2010-10-19 16:46:37 [Message] fib_1618 -> Chat: how about this? 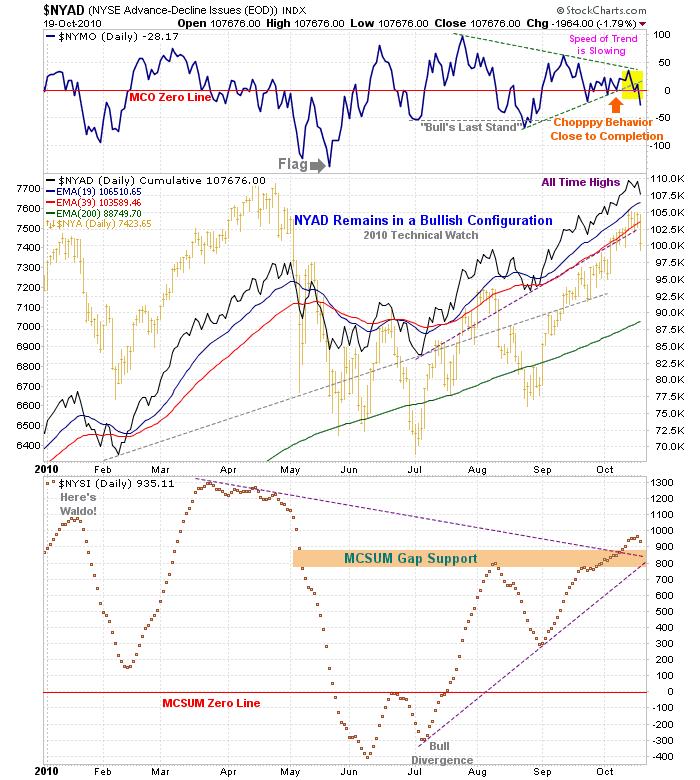 2010-10-19 16:46:48 [Message] fib_1618 -> Chat: do you believe that the market is entitled - given the advance we've had - that a snapback to both the rising bottoms line and the MCSUM gap resistance zone would be anticipated on the MCSUM? 2010-10-19 16:49:00 [Message] fib_1618 -> Chat: it was a "shot off the bow"
2010-10-19 16:49:10 [Message] fib_1618 -> Chat: but remember what I said? 2010-10-19 16:49:23 [Message] fib_1618 -> Chat: that the market generally doesn't turn on a dime? 2010-10-19 16:51:44 [Message] doc -> Chat: So back to our current chart, for the continued IT bullish stance and for this downdraft to be purely correctional, we would want the MCO to stay above the "bulls last stance", or last resort, above the lows of August on this sequence, right? 2010-10-19 16:51:48 [Message] darris -> Chat: You could could make a case then that the equities might do something like Gold did, if one thinks today was a shot across the bow. 2010-10-19 16:52:44 [Message] fib_1618 -> Chat: to either regroup or as a finishing move?? 2010-10-19 16:53:49 [Message] fib_1618 -> Chat: "until proven otherwise"
2010-10-19 16:58:35 [Message] thespookyone -> Chat: the dollar 4 looks just about done-can the equities be that close, as well? 2010-10-19 16:58:55 [Message] fib_1618 -> Chat: and if you apply a 20 day EMA on the Dollar chart...what do you see? 2010-10-19 17:00:05 [Message] fib_1618 -> Chat: where did we close? 2010-10-19 17:00:10 [Message] darris -> Chat: Normally, we do not top out very quickly after closing on a new recovery high like we did on Monday. Normally, we see a lot of intraday failed rallies back near a recent high and several days of end of day sell offs. 2010-10-19 17:06:28 [Message] fib_1618 -> Chat: reason? 2010-10-19 17:07:22 [Message] fib_1618 -> Chat: and is anyone really seeing any emotion with the metals as yet? 2010-10-19 17:10:39 [Message] fib_1618 -> Chat: of course, I'm referring to the 1/4 point increase in China's rates and this maybe pushed gold lower? 2010-10-19 17:11:20 [Message] fib_1618 -> Chat: could they be the body that controls the direction of gold? 2010-10-19 17:14:38 [Message] fib_1618 -> Chat: and what was the FED doing then? 2010-10-19 17:14:45 [Message] fib_1618 -> Chat: what was it what Congress passed? 2010-10-19 17:16:50 [Message] fib_1618 -> Chat: add a bit of bad news and viola! 2010-10-19 17:18:43 [Message] fib_1618 -> Chat: how much of a move might there be? 2010-10-19 17:20:03 [Message] fib_1618 -> Chat: it's a "reasonable expectation"
2010-10-19 17:20:58 [Message] fib_1618 -> Chat: so why bother? 2010-10-19 17:22:22 [Message] fib_1618 -> Chat: just so you can say "I picked the top"
2010-10-19 17:22:32 [Message] fib_1618 -> Chat: "look how great a trader I am!" 2010-10-19 17:32:36 [Message] darris -> Chat: Not material to our context here, but all the NDX did today was fill the Google earnings gap up. Apple did not even trade at the AH low from Monday night (292), and I do not think it even traded below 300 in the day session today. 2010-10-19 17:34:05 [Message] fib_1618 -> Chat: yes..seems like GS had a good day shorting the market! 2010-10-19 17:35:40 [Message] fib_1618 -> Chat: and when was the last time you saw the markets top out with the MID caps showing this kind of strength? 2010-10-19 17:36:00 [Message] fib_1618 -> Chat: same question with the SML? 2010-10-19 17:38:41 [Message] doc -> Chat: do the technicals support a .238 correction? 2010-10-19 17:38:49 [Message] doc -> Chat: a .38? 2010-10-19 17:39:18 [Message] fib_1618 -> Chat: how about this? 2010-10-19 17:39:43 [Message] fib_1618 -> Chat: how about a snapback to the late July/early August tops? 2010-10-19 17:42:16 [Message] doc -> Chat: So would you consider dollar cost averaging long at the .236 area with half and the rest at .38? 2010-10-19 17:44:07 [Message] doc -> Chat: Fib, I've been away a bit, busy at work. Did you post going long your cores? 2010-10-19 17:45:14 [Message] doc -> Chat: Been waiting for the pullback like me? 2010-10-19 17:47:09 [Message] doc -> Chat: I sensed in mid Sept that toooo many people were looking for that pullback and that it just might not come... and it really didn't come, till now maybe. 2010-10-19 17:49:10 [Message] fib_1618 -> Chat: I hear same thing in December - "remember the November puts!" 2010-10-19 17:51:30 [Message] fib_1618 -> Chat: it will be because of "something else"
2010-10-19 17:51:33 [Message] darris -> Chat: On the Bond CEF data that Randy provides, there has been weakness creeping in the last couple of weeks. It is very interesting that this same type of action occurred last year around this time as well. There are still some things which show end of year book keeping at the end of this month. I only point this out because the Oct 2009 correction was swift, sharp, and quick. We then floated right back up in early November, as far a the effect it had on equities. 2010-10-19 17:54:04 [Message] doc -> Chat: I know that 2 weeks ago I pointed out the same thing for XLE (AD and UD divergences) and it kept going up and up. I finally reasoned that with USD dependent sectors, one may have to make allowances for strong directional moves in the USD that might affect that sector independent of AD and UD lines. 2010-10-19 17:55:06 [Message] fib_1618 -> Chat: well...with some "disclaimers"
2010-10-19 17:56:14 [Message] doc -> Chat: yes and the AD and UD lines said that price was overextended, so what did it do? Got more over-extended! 2010-10-19 17:57:49 [Message] darris -> Chat: Last year I got all beared up when we looked at the Municipal Bonds as far as their part of the Bond CEF make up. At the time the news was that California would default. I just feel there is a chance that there is mechanical selling or squaring that goes on with companies that have end of year book keeping this month. The NYSE commons today were down 2% on an equally weighted basis, but the negative money flow seemed a little light. 2010-10-19 17:58:37 [Message] doc -> Chat: all i know is that the XLE UD is making lower highs for 5 months while price is noticeably higher. I think it is the USD effect, that's a better explanation then anything else I've heard. 2010-10-19 17:58:55 [Message] fib_1618 -> Chat: STVO's remain "overbought"
2010-10-19 17:59:24 [Message] darris -> Chat: On the Energy sector, Randy has a data base of about 150 related stocks, and that data set blew the April highs away last week. May have come back down to earth today with Oil down a lot, but besides PM issues, it is the only sector to take out the April highs. 2010-10-19 18:00:24 [Message] fib_1618 -> Chat: "oversold"
2010-10-19 18:00:38 [Message] doc -> Chat: Maybe the DP AD and UD lines for XLE are off then? 2010-10-19 18:01:14 [Message] fib_1618 -> Chat: link? 2010-10-19 18:01:43 [Message] fib_1618 -> Chat: in the index of links? 2010-10-19 18:01:52 [Message] fib_1618 -> Chat: huh? 2010-10-19 18:04:36 [Message] doc -> Chat: Do you see on DP what I mean about the AD and UD lines for XLE diverging badly with price? 2010-10-19 18:09:37 [Message] darris -> Chat: Correct, I just meant what is the absolute number of components being used? 20, 50, 100.....Like the SOX (18 stocks) a small number of components can make a big difference. Randy uses about 170 components for the SOX-EW data set, and the index price is markedly different than the SOX. Correlated, but amplitude not close. 2010-10-19 18:13:12 [Message] thespookyone -> Chat: your take - 4 over then, or super close-considering the open 10's, ect.? 2010-10-19 18:13:41 [Message] fib_1618 -> Chat: maybe a triangle four...A complete? 2010-10-19 18:13:53 [Message] fib_1618 -> Chat: bounce higher for wave B tomorrow - etc. 2010-10-19 18:14:47 [Message] fib_1618 -> Chat: any other questions? 2010-10-19 18:15:48 [Message] doc -> Chat: This chat room is looking for a bottom, not a top. 2010-10-19 18:18:51 [Message] darris -> Chat: Time to stay Alert then. Have a good evening!! 2010-10-19 18:19:03 [Message] doc -> Chat: you too!